My List can be found in my Game 1 Battle Report, here. So this army is very different from the one I though in Game 2, very light on shooting and several big blocks of Dwarves. The addition of the Clan Warriors was a nice surprise, I think this is the first time I’ve fought Clan Warrior blocks rather than Greybeards or little scoring units of 10 Clan Warriors. The unit with Spears scare me a bit as I’ve not actually come across spears in v 2.0 of the game, I know they aren’t as bad as they used to be but they were horrific to cavalry in v 1.3. The King’s Guard could do some very nasty things to me indeed and although the King isn’t a tough to kill as some Dwarven Kings out there I just don’t think I have anything that could kill him. My Duke possibly could but if he messes up his one chance to kill him then he’s dead. The Copters are an annoyance for me , they’re almost too good to be called chaff as with Resilience 5 they can take a lot of punishment to bring down, I know that they will inevitably cause me some pain, hopefully I can shoot them off with Crossbows but it’s a big ask for them. Going in my basic plan is to avoid all the blocks and try and mop up the copters and war machines. 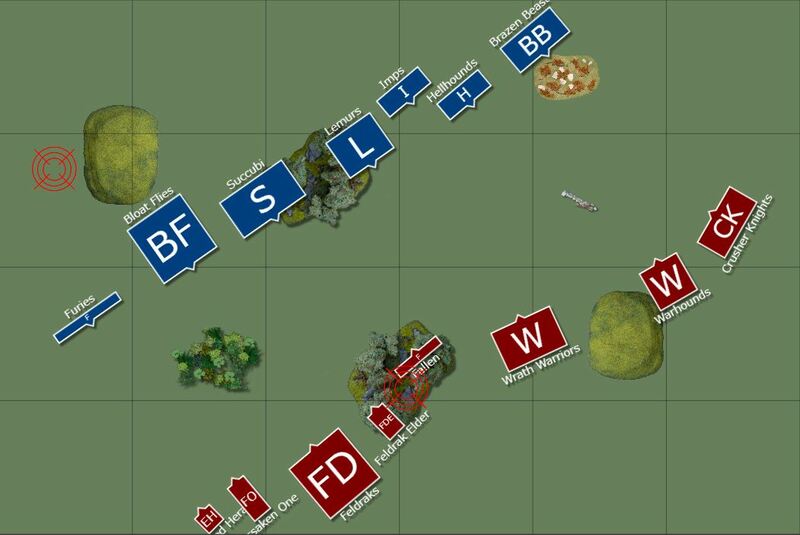 The TO rolls for Deployment and secondary objective and we get refused flank (diagonal) for the deployment type and the worst possible secondary objective for me, Capture the Flags. With 3 big blocks of Dwarves I have little to no chance of capturing any standards, unless I can get some nice flank charges and break steadfast but I’m sure the Dwarves won’t make that easy for me. I plan on just getting the Hold Guardians, leaving the rest and hope my units are still alive at the end. That could have gone better for me but I have nothing to blame except myself for that unmitigated disaster. I deployed badly and turning the Knights of the Realm around to give my opponent a rear charge with the Grudge Buster was a huge mistake compounded by further mistakes of letting myself get cornered with the Knights Aspirant meaning they had to charge. I should have deployed my Knights of the Realm where the Knights Aspirant were and put the Aspirants on the left flank and back far enough so that the Steam Copters couldn’t get behind me like they did. I really seems to struggle fighting against flyers and I just don’t know how to handle them, the Steam Copters are a particular tough nut to crack as well as they can take a lot of punishment with Resilience 5 and a 4+ Armour Save. I may have to consider taking the Storm Clarion to help combat those flying menaces. I thought going into turn 2 I was still in a good position though, the Questing Knights were going to flank the Clan Warriors next turn and net me some big points. The Pegasus Knights were going to murder the Hold Guardians and then we avoid the rest of the army, didn’t quite work out that way though. I still think the Pegasus Knights and my Duke should have done more damage to the Hold Guardians, at least enough to stop them being steadfast, that was the only bit I felt I was unlucky at. I completely didn’t even think about the Grudge Buster overrunning into the Pegasus Knights but I don’t think that mattered all that much. The Pegasus Knights were never going to win combat against the Hold Guardians after the charge, they just aren’t strong enough. Having everything be steadfast against the Pegasus Knights is a real problem for them, they great in a support roll but they cannot go toe to toe with units that they can’t break on the charge, I mean any unit too, even a big block of lowly infantry will eventually grind them out. As for my Duke, the less said the better. I think for Game 5 my basic plan for him is just to keep him out of harm’s way and hope he survives. The core units of infantry don’t worry me too much, my knight blocks can take care of them. If I let the Crusher Cavalry charge me then that could be problematic. The main threat that worries me is the Weaver of Change, my Duke has the potential to take it down but it can never be guaranteed and if he doesn’t then he’s dead, especially as the Aether Wand will give the Weaver a ridiculous number of attacks by the end of the game. The Deployment Type and secondary Scenario was determined by a roll of the dice by the TO and we were playing Encircle and the secondary objective was Breakthrough AGAIN! (Which again was the best choice for me). My opponent won the roll off to see who picks sides and so he decided to be the defender in this deployment type so I was left with the big flanks and small middle. For Spell selection I picked Awaken the Beast, Totemic Summon, Break the Spirit and Breath of the Lady, in hindsight Swarm of Insects would have been a good choice as that would have taken some wounds off the Weaver if I had cast enough. I was thinking that I would need combat buffs to try and do as much damage to the Daemons as fast as possible and try and pop them quickly. My opponent took Thaumaturgy on the Weaver and selected Hand of Heaven (D6 hits at Strength D6), Cleansing Fire (Breath Weapon with Strength D3+2), Trial of Faith (both roll a D3, caster adds 1, lose the difference in wounds) and no one takes Thaumaturgy without taking Wrath of God (No description necessary)! That was a horrific beating for the brave knights of Equitaine, the Daemon magic was far worse than I was expecting, I was so focused on stopping Wrath of God that Cleansing Fire and Hand of Heaven were free to just absolutely wreck my army. Magic alone wiped out the Knights of the Realm in like 2 rounds! I definitely could have handled the magic phases better but we both had some stinking rolls in the magic phase. The main big mistake I made was not putting the Duke in with the Pegasus Knights to at least give him some protection from the Daemonic shooting. Even if he wasn’t shot off I’m not sure how useful he would have been in this game anyway, he will kill whatever he charges but then he would just get hit by like 2 chariots and a Weaver of Change and die. I should have deployed the Pegasus Knights in the centre of the board to cover the advance of the rest of my army up the left flank as they tried to get some scoring done. I foolishly gave away my Pegasus Knights when I didn’t need to. By turn 5 I should have just kept their points safe or put them in a good position for a last turn charge. Still amazed at how easily the Pegasus Knights fell to the Blood Chariot when the Knights Aspirant just refused to die to chariots at all. So not your typical Dwarven Holds list, a lot of shooting which would normally worry me but at least they’re crossbows and not handguns. 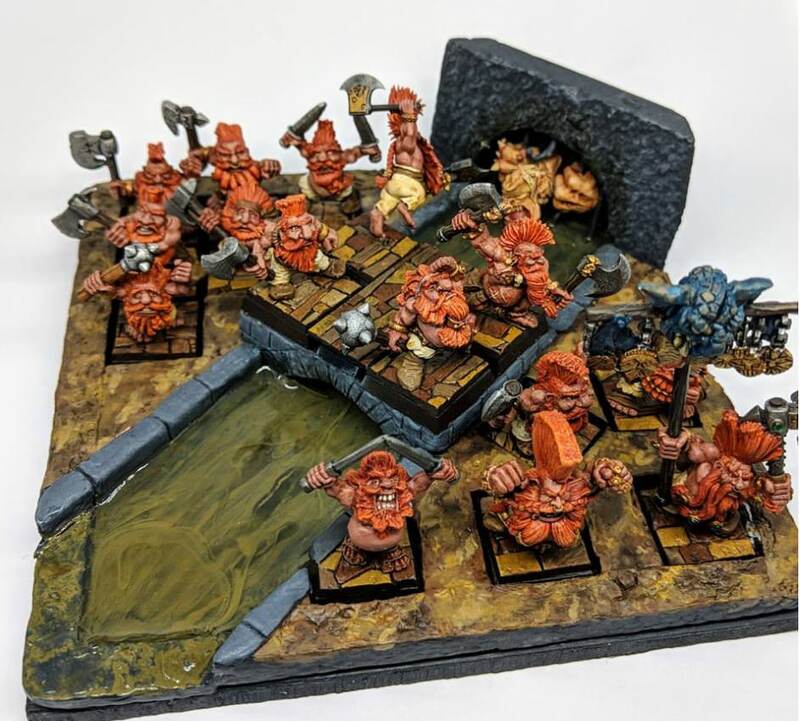 I’m going to have to close the Dwarves down quickly and hopefully smash through the small units as fast possible. The Pegasus Knights should be very useful in this game with their -1 to hit thanks to skirmish and the Banner of Roland meaning the opponent can’t stand and shoot against them when they charge as well as the extra Aegis Save. The lack of a rank may be problematic for them but I’m hoping they hit hard enough for it to not matter. The Seekers could cause me all kinds of problems with them being unbreakable, I am going to have to wipe them out to a stunty because they’re not going anywhere and with vanguard they are going to be breathing down my neck in no time. Hopefully my shooting and magic can whittle them down enough for me to finish them off with a Knight Block. The game ends there and the objective is drawn so it’s just down to points scored. I manage to kill 2199 points of the Dwarven holds and lost 1436 points giving me a 12 – 8 victory, yay! I thoroughly enjoyed that battle and not just because I got a win. It was a very swingy battle and after the shooting of the Dwarves in turn 2 I thought I was out of it, that was a lot of knights they murdered in one round of shooting! The stars of the show were the Knights Aspirant, well those last 2 Knights Aspirant in particular, how they managed to survive that long is beyond me, I guess there survival made up for my shocking armour rolls beforehand. One thing I kept forgetting about for the whole game was The Oriflamme, I only ever remembered when it came to taking break tests, I always forgot to make my opponent take fear tests at the start of each round of combat. It could have made a big difference but it probably wouldn’t have as those Dwarves never failed a single discipline check all game, sturdy gits! I was extremely disappointed in the Pegasus Knights at the very end, how on earth could they not kill more than 4 Rangers! They had the 4 Duke attacks, 6 Knight attacks, 6 Peg attacks, 4 stomps and the Totemic Beast as well. After their poor showing in Game 1 I’m going right off the Pegasus Knights, I find people are more scared of them than they should be so I’ll just let them keep that feeling whilst I fly about and try not to die. One thing i could have done better was deploying the Crossbows on the flank rather than the centre so that the Dwarves had to work for those points if they wanted them, by putting them right in the centre it just made them an easy target for them. Also i should have been shooting those Seekers with my Brigands for the whole game, probably could have finished off those last 3 guys. Still can’t get over how quickly those Dwarves crossed the battlefield, if for a second I thought about how quick they can move I would have deployed very differently and spread my big units out a bit more so there’s no way they could have cornered me like they did with the Knights of the Realm. Anyway, a win is a win so I can’t complain too much. Game 3 coming next week. After breaking my ankle earlier in the year and then getting married I’ve had a quite the break from the 9th Age. Well, I’ve finally been able to attend a tournament in what feels like forever! So it was time to shake off the rust and attend Breakthrough 2018. I’ve not played as much 2.0 as I would have liked in the last few months as I’ve just been super busy with real life stuff sadly so it was nice to get myself back into it. For this tournament I was going to use my Kingdom of Equitaine, one of my favourite armies that I have been pushing around now for a couple of decades. The Knights in shining armour and the bright multi coloured heraldry always appealed to me as a fan of history and as a painter so I think that’s why I’ve stuck with them for so long. I only had a few practice games using a variety of different lists and unfortunately the list entry deadline crept up on me and I ended up just submitting one of my practice lists, a decision I would come to regret. There’s a few odd choices in there but there was method to my madness (well some anyway). The Duke build is far from optimal, I wanted a precision missile that could pick and choose his targets and then devastate them. The Virtue of Audacity and Divine Judgement should make him the king of slaying monsters, with rerolls to hit against large models and rerolls to wound against towering presence whilst doing D3+1 wounds on the charge there isn’t a monster alive that could withstand that charge. I took the Grail Oath with the mistaken belief that that would give him Divine Attacks, sadly it does not but I only realised that too late. The Faith of Percival was there to keep him alive from cannon balls and the Basalt Infusion will help him survive from those pesky Flaming cannon balls! The Paladin is nothing special, he has a 1+ re rollable Armour Save and he’s just going in with the Questing Knights. I picked Shamanism for the Damsel as I’d tried the other lores and found them somewhat lacking. Druidism is just too high a casting value for the good spells and I always found myself just never getting any spells off. I like Divination but found the range for the spells to be too short. So Shamanism it was for me, I was particularly looking forward to bringing on some Totemic Beasts! I like big knight blocks which explains my choice of cavalry. I thought I’d try out the Oriflamme for the Questing Knights just to see how it fairs, on paper it sounds good but I’ve not heard great things. 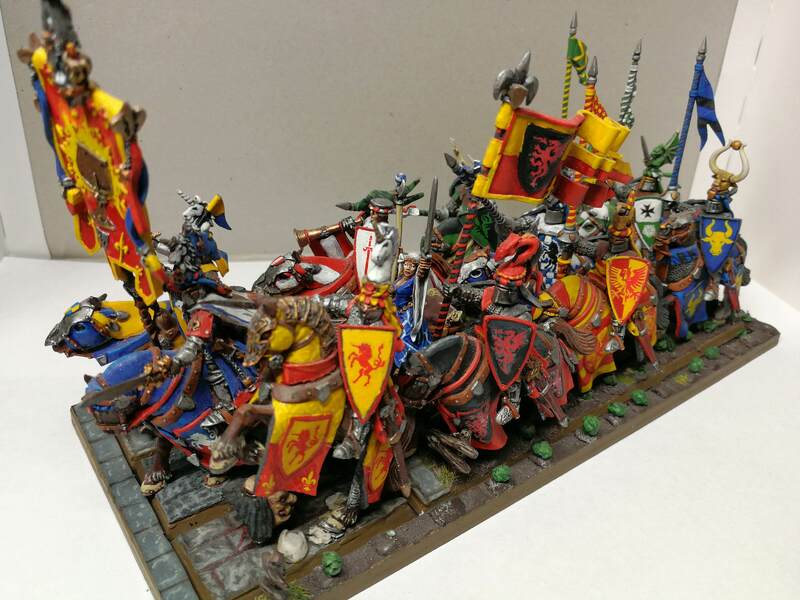 The Banner of the Last Charge on a big unit of Knights of the realm is a must and 2 units of 5 Knights Aspirant would probably be better than a unit of 10 but I like big units. I’m running them 5 wide so maximise on the +1 Attack on the charge. The Crossbows are there purely so that I had an excuse to paint my old Marksmen of Miragliano models that I’ve had knocking about for ages. Now that KoE can take Crossbows I had to bring a unit of them to the party. The Brigands and the Yeomen are the chaff, I don’t have high hopes for them, just hope they die a glorious death. I’ve taken 5 Pegasus Knights as a bunker for the Duke when there’s Warmachines or dangerous magic knocking about. I always find Pegasus Knights to be one of those units that people hate to fight against because they’re so manoeuvrable and hard to catch but I always found them to be expensive and a liability but we’ll see how they fair. Anyway, for Game 1 I was drawn against Saurian Ancients and an army that is going to completely shut down the speed of my Knights as there is so many flying units they’re will be nowhere to hide. I’ve had some crossbowmen knocking about for a few years now and have never used them so this was basically an excuse to get them out an see how they fair. Now that Knight Errants are a reasonable price again I had to take them and I’m still persevering with the Questing Knights but I have yet to be impressed with them. I’ve got 3 main threats with the 3 big blocks of knights. I’ve taken a fairly shooty army to hopefully draw my opponent to me, weaken up any big blocks with the Trebuchets and then smash them off with the knights. That’s the plan at least. So my opponent has a general with discipline of 10 and an 18” range on it with the Household Standard so I’m not expecting them to do a lot of fleeing. I hate the Reiters so I will definitely be trying to shoot them down with the Bowmen, their pistols are lethal against my knights and despite being chaff they cannot be underestimated. My number most hated unit in the Empire book though is the Arcane Engine with Arcane Shield, the -1 to hit on all units with 6” will severely limit my ability to get kills and I don’t need any help normally to rubber lance so that will just add to my frustration. It’s also got the Wizard on it so I’d like to Treb that if I can but I should be sensible and go for the Imperial Guard, weaken them up and then smash them off (I’m not sensible by the way). The Sun Griffons always give me a worry, they can’t be underestimated either, a unit of just 3 of them can put a severe dent in my units, even if I charge them. We roll for scenario and get Marching Columns, one I’ve not had the pleasure of playing, the secondary objective is Breakthrough. For my spells I pick Breath of the Lady, Summer Growth, Master of Earth and Stone Skin. I decided to not pick The Oaken Throne as it takes up one of my spell slots and I generally find it wastes dice as opponents let it through with the aim of dispelling everything else. Plus with taking the Hereditary spell it would only leave me with 2 other spells if I took it. I wanted to take Magical Heirloom, which would have gotten me around this problem, but I ran out of points. Sorry I’ve been silent for a while and not done any blog posts or bat reps for a couple of months. Last month I went on my Stag Do (Bachelor Party for our American friends) to Amsterdam and whilst there I slipped on some mud and managed to break my ankle! To make matters worse I waited two days before going to hospital because never in a million years did I think I had broken my ankle, I mean I slipped on some mud, how could that break a bone? So I’ve been in out an out of hospital and had to keep off the foot for a while. Sadly this meant missing TEC 18 this month and pretty much missing out on any hobby, except painting, I am getting lots of painting done at least. Anyway, I’ve decided to write up a Bat Rep of practice game I did back in March. My Kingdom of Equitaine vs Dwarven Holds. Basically running a triple threat with three big blocks hoping that they will carry the day , do lots of killing and stay alive long enough to deny my opponent any points. Playing against Dwarves though this may be difficult, they don’t die easily and they can easily hold a charge against one unit of Knights so I’m going to need some multiple charges. The little units of Knights of the Realm are there to be a pain to my enemy and redirectors if necessary, the Yeoman are there to die. So my Opponent has two blocks of Dwarven infantry that I probably won’t be able to take down without a triple charge and at least 15 rounds of combat. So I’m probably best off leaving them well alone and trying to pick off everything else, especially the Grudge Busters. The Deployment type was Frontline Clash and the Secondary Objective was Capture the Flags, a difficult objective for me as the small units of Knights of the Realm will easily be killed and I’m going to struggle to kill more than 2 of my opponents scoring units, my best hope is to wipe out the Crossbows and possibly the Greybeards if I can catch them with a multiple charge. 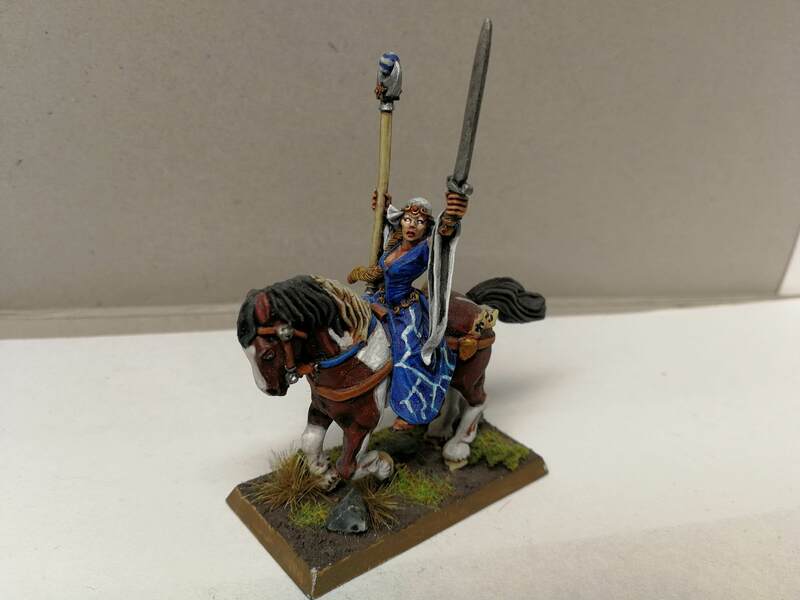 Just thought I’d write a quick hobby musing about the Kingdom of Equitaine list I’ve been running in 2.0 so far, how it’s been doing and how the hot fix has affected it. I have a large KoE force all painted up but some are definitely painted than others and I’m a stickler for bringing along the nice looking soldiers to the battle. So after looking at the KoE Army book for ages trying to come up with a list that I could use given the models that I have I settled upon the following list. The basis of my army revolved around 3 large blocks which woulf hopefully do all the hard work. The Damsel was there to help the Knight buses hit more reliably, especially with the Hereditary Spell and the buffs from Divination. The Duke’s role was to help protect the Knight of the Realm block by soaking up attacks on the unit and ensuring that more knight survive to attack back. The Peasant Crusaders acted as a mini anvil until the Knights could get in and smash whatever was attacking them. The Yeoman were just chaff and the Bowmen and scorpions were there just for a bit of ranged threat. Going into my games the plan was to push all 3 knight blocks around together and charge whatever was in their way but it’s amazing how rarely I ever stuck to the game plan. I found myself struggling against enemy chaff as the Bowmen just weren’t doing the job and the Magic Missiles of Divination were just not going off. The problem with running a predominant buff lore is that your opponents know that they can just let the buffs go off if the units being buffed aren’t in combat, they then just dispel the missiles and you’ve wasted a magic phase. That is not to say that Divination has been completely useless, when the knight blocks are in combat it helps tremendously but the shining star really is the Breath of the Lady, what a fantastic Hereditary Spell, it helps offensively and defensively so it’s really useful. With the redesgned Magic Phase she is much less prone to blowing up whole units of knights now due to some unlucky rolling, so Damsels are definitely back in if you ask me! The Knight blocks each faired differently in their own way. The Knights of the Quest are very good at the grind but as with all knights they feel each and every loss, having a unit of 12 is great but as soon you begin to lose some knights their effectiveness is immediately reduced. So even though they are good at the grind there is little that they can go toe to toe with and win a war of attrition. Obviously they are not there to be fighting hordes of infantry so they shouldn’t be winning those long fights, I had them fight a hydra and some Chaos Knights. Against the Hydra they took 3 rounds of combat to kill it at the end of which there was about 3 knights left. Against the Chaos Knights they won but again, there wasn’t a whole lot left of them by the end. The Knights of the Quest should be used as a very expensive hammer, used for precision strikes of the perfect enemy and they better break them or they are toast (in fact, apply that to every KoE knight). The Aspirants were great on the charge and then instantly lost any threat they once posed after that. 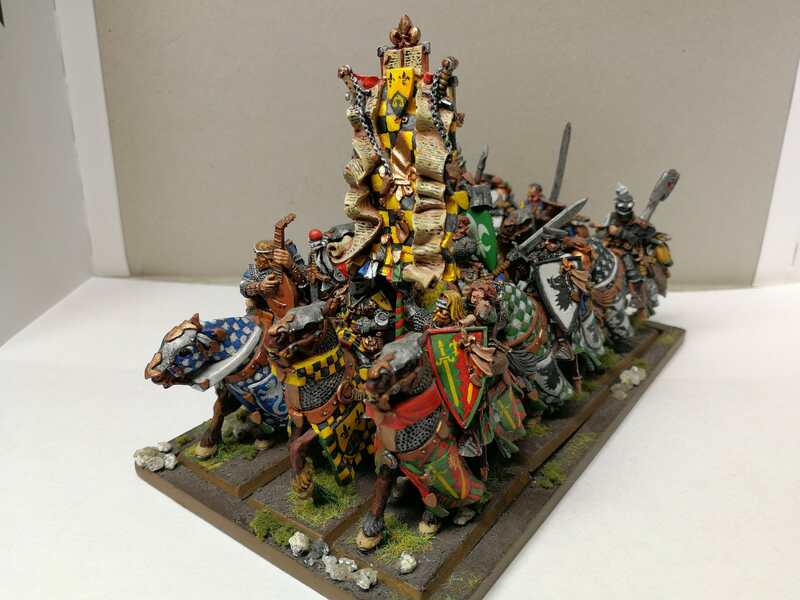 I love having a big unit of 15 as they look amazing but 15 knights leaves a big flank that any smart opponent will wait to be shown and then pounce. That has always been the problem with the Lance formation, maybe it’s time to abandon it on large units. They might work better in a 12, 6x2. The Knights of the Realm were the bedrock for me and combined with the Duke they just didn’t die at all. The games I won or drew were down to this unit not being destroyed and maintaining a huge amount of points. So 2 big nasty fighting blocks with great weapons that will chew me up if I fight them dead on. A fair amount of shooting, the cannon is big worry for me as it will no doubt shoot off my big monsters and the flame cannons D3 wounds could do some damage to me too. I need to take out the warmachines as early as possible with the dogs or Fallen and hopefully get some combo charges on those blocks, preferably a flank charge. My Opponent had a lovely scenic bases for the seekers with them walking through a town with a bridge, a stream and a little troll poking it’s head out of the sewer.